The drone industry is rapidly expanding in the U.S. In fact, the FAA (Federal Aviation Administration) is predicting that the number of all hobbyist sUAS (small unmanned aircraft system) will hit 3.55 million by 2021, and the number of commercially-used sUAS drones will increase to a half million by the same date. It’s more than likely that you’ve seen a drone before. Between the amount of smaller toy drones sold during the holidays and the increasing number of commercial drones, they’re everywhere. The marketplace for drones is currently extremely stratified, with most Christmas presents costing between $50-$300, their “prosumer” counterparts falling into the $2,500-$4,000 range, and the high-end industry versions reaching tens of thousands of dollars! With the advancements in technology, high-end cameras, and sensors, the utilization for drones has wildly increased—including marketing. How do marketing and drones work together? A drone’s most popular use for marketing is to record aerial footage. Video is unlike any other form of media, especially when crafting a brand message and delivering it to the consumer. Traditionally, sweeping shots of buildings, festivals, commercial shoots, and more have been limited by the necessity of a special helicopter. Furthermore, the expense of aerial footage had small and medium-sized businesses at a huge disadvantage. However, with the rise of drones, a much smaller, nimbler, and most importantly, a cheaper crew can capture Hollywood quality shots. Now, all you need is a drone and camera, and the more high-end, the better of course. Oh, don’t forget an FAA certified drone pilot. Arguably, the most popular way drones are used is event marketing. From touring music festivals to sporting events, their promo videos probably featured aerial footage from a drone. Drone footage for event marketing often includes expansive shots, like the mapping of a fairground or chasing cars through a parade route. In any scenario, it allows a marketing team to supply consumers with a unique perspective and a glimpse of a desirable experience. Live streaming is certainly not a new phenomenon. More than likely, you’ve seen celebrities or influencers use it on Facebook or Instagram. However, it has also been adopted by families wishing to share a special moment or for professionals to watch industry keynotes and presentations. Now, live streaming has become publicly available for drones. If a brand needs to show off a product demo or host a live Q&A session, a drone shot sets that stream apart from other feeds, creating a more engaging and captivating consumer experience. The point-of-interest appeal in marketing spans across multiple industries from real estate to construction. A point-of-interest shot is when the drone uses various sensors to fly in a perfect circle around a singular point such as a new housing development. The footage from these types of shoots provides fantastic marketing materials for property layouts, fire evacuation maps, 3D tour videos, and much more. How are drones adapting to other industries & working for SMBs? One of the most popular applications of higher-end drones is in the industrial and utility inspection area. These are used to inspect things such as construction sites and wind turbines when weather conditions and other circumstances prevent humans from safely conducting them. These drones utilize specialized equipment and camera gimbal setups, including multiple cameras, thermal imaging sensors, and Li-Dar sensors. Li-Dar sensors use pulsed lasers to measure distance and create 3D representations of a structure. The drone industry has rapidly expanded into the agricultural sector, attempting to both spread fertilizer and other “pesticides,” as well as gain better mapping and imaging of crops. This can be used to determine crop yields, improve field management, and much more. Check out the video below to see some agricultural drones in action. One of the more interesting areas that drones are expanding to is the emergency services industry. Drones are often seen as an issue for public safety; just recently a UK airport was shut down for roughly 24 hours due to a drone in its airspace. However, just as quick as drones are being abused by some, they are being utilized by police and other law enforcement. Special attachments such as lights, speakers, and the ability to carry payloads of emergency supplies have allowed for police and rescue teams to go where they could not before. A drone, for example, can search large areas faster than a normal search team, and venture into dangerous situations, thus minimizing the risk to emergency personnel. Check out this twitter feed of a dedicated drone team for a local UK police department to learn more about how drones are being used in the industry. Below is an example of search and rescue drones in action. Drones are a lucrative tool for the film industry. Their flexibility with camera payloads and advancements with 3-axis gimbals make them an attractive option for small independent films and major blockbusters alike. Gone are the days where all aerial footage requires a much more expensive helicopter for the perfect shot. 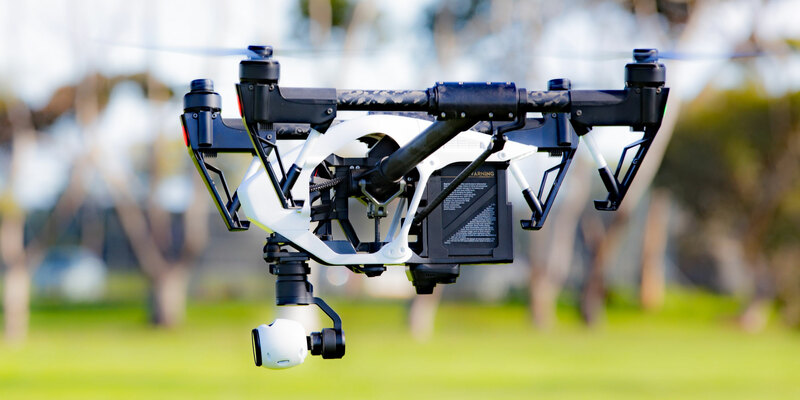 While larger drones can carry high-end cinema cameras, the drone market has expanded with product offerings like the DJI Inspire 2, which has been used to make entire indie movies as seen below. It is IMPERATIVE to understand the current regulations put in place by the FAA. As the number of drones in the United States has drastically increased, so have the number of FAA safety measures and regulations. A drone pilot understanding the rules or not can be the difference between a successful flight and legal action, from both the government and private citizens. When flying any drone, there are rules put in place that both hobbyist and commercial drone pilots must follow. These rules relate specifically to all drones that weigh less than 55 pounds, as the classifications change from sUAS to UAS over this weight. It is important to note that most can avoid restrictions with an FAA-approved waiver. Always avoid manned aircraft and never operate in a careless or reckless manner. You must keep your drone within sight, and/or have a visual observer always keep your aircraft within unaided sight. You can fly during daylight (30 minutes before official sunrise to 30 minutes after official sunset, local time) or in the twilight with appropriate anti-collision lighting. The maximum allowable altitude is 400 feet above the ground, higher if your drone remains within 400 feet of a structure. You currently cannot fly a small UAS over anyone not directly participating in the operation, under a covered structure, or inside a covered stationary vehicle. *There are currently proposed amendments the FAA is reviewing to adjust rules relating to flying over crowds. Every commercial drone flight must be conducted by an FAA-certified Part 107 sUAS Remote Pilot. The first penalty for flying a drone commercially without the proper certifications can result in a warning from the FAA to start but can potentially immediately jump to tens of thousands of dollars for subsequent infractions. Learn more about the certification process on the FAA’s website. Here at DVS, we have an in-house video department with over 20 years of experience behind the lens. Our team has the capability to take your video shoot from the first concept to the final edit. Our record of professional shoots, coupled with an on-staff FAA-licensed Part 107 Remote Pilot, means we have not only the ability but also the knowledge to make a drone video shoot work for your needs. Learn more about our video and animation services on our website, or get in touch directly at dvs.com/contact.